First he was dropped from England's squad by new head man Steve McLaren. 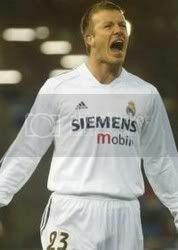 Now David Beckham is dealing with being benched by Real Madrid. After reports that contract extension talks between the former English captain and the Spanish giants had stalled, there is now loads of speculation of what's next for arguably the most famous soccer player in the world. The interesting thing is how good the odds are that David Beckham could be headed to MLS. British bookmakers Williams Hill have set the odds at 6 to 4 that Beckham is back with Real Madrid next season. But, they have a move to MLS at 4 to 1, followed by a move back to the EPL with Arsenal at 6 to 1, retirement comes in at 7 to 1, and a return to Manchester United is listed at 20 to 1. Beckham isn't the only big name to be linked to a potential move to MLS this offseason. Soccer.com has a rumor that former US captain Claudio Reyna could be leaving Manchester City to play for former US national team head coach Bruce Arena. Could MLS ask for much more than Donovan and Beckham playing in LA for the Galaxy and Bruce Arena coaching and Claudio Reyna playing for the NY Red Bulls? I wouldn't count on either move happening, but it is fun to think about! So I'm 0 for 3. At least DC United is 2 for 2! The Revolution got Shalrie Joseph back from a hand injury just before the playoffs and now they've lost him again. This time it is due to a one game suspension by MLS for violent conduct in the first match of their Eastern Conference Semifinal playoff series with the Chicago Fire. Joseph was suspended for throwing a left elbow into the face of Chicago's Ivan Guerrero during first half stoppage time of Sunday's game. The interesting thing about this suspension is that the incident took place just a few feet away from referee Tim Weyland who allowed play to continue on as Guerrero had been all over Joseph's back when he threw the elbow. This news is not what New England needed to hear as they enter the second leg of the two game, total goal series trailing the 2006 US Open Cup champions 1-0. After the crowds at the first four playoff games failed to average over 10,000 fans, MLS is hoping that having games in Dallas, Houston, and DC this week will help boost the numbers. Add in the extra week for group sales efforts and marketing to take hold and things hopefully will get better. But, there will always be the struggle to sell tickets to games with a short lead in period and when the NFL is in full swing. Here is where all the arguments start about how long the MLS season is, why having the playoff structure stinks, and how MLS needs to change over to the "world calendar". MLSNet.com has launched an hour long internet radio show hosted by Sean Wheelock and KC Wizards and US National Team defender Jimmy Conrad. The first episode featured guests such as New England Revolution forward Taylor Twellman, Houston Dynamo defender Craig Waibel, and most importantly, Jimmy Conrad's dad. The show could use a few tweaks here and there (The whole "Jimmy & Conrad" segment didn't work for me), but all in all, it was very entertaining. The best part was when they had Twellman and Waibel on and Conrad just went with the flow. I also got a chuckle when an e-mailer complained that New England head coach Steve Nicol didn't get grilled enough by the media about why he keeps José Cancela on the bench so much and why Nicol wasn't questioned about subbing in defensive midfielder Daniel Hernandez when the Revs trailed Chicago on Sunday as opposed to Cancela. The rant reminded me a lot of some of the complaints that I've heard in Rochester this past season. The show is good stuff and this week's episode is available for download and the next show will be on Halloween.